Grass makes up the largest visible area in most yards. Homeowners in northern areas face challenges in growing a lawn that will stay green and lush. Temperatures can fluctuate as much as 100 degrees Fahrenheit over the course of the year; grasses grown in the north must have the ability to withstand winter cold and summer heat. With unpredictable rainfall during the hot summer months, many cool-season varieties turn brown, going dormant until cooler, wetter weather arrives. Choosing the variety of grass seed that best suits your local climatic conditions, along with a consistent maintenance program will help ensure that your lawn always looks its best. Spreading by underground runners, Kentucky bluegrass (Poa pratensis) will quickly fill in bare patches and is excellent for crowding out lawn weeds. It grows best in full sun or light shade. 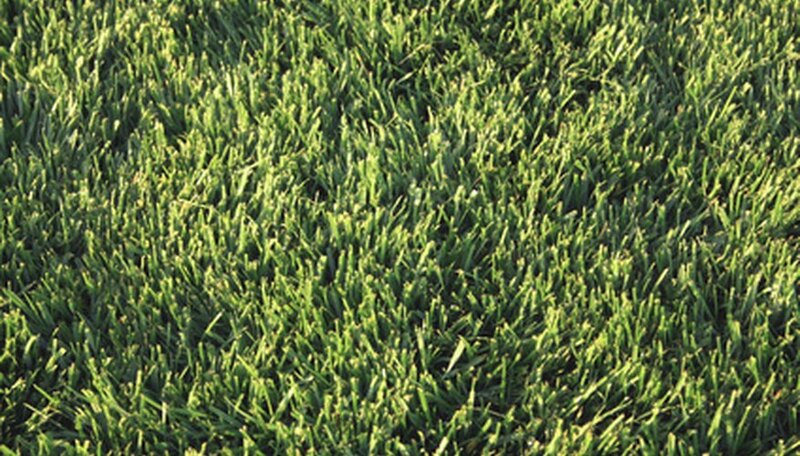 It is a rugged, tough grass and is suitable for sports fields when combined with perennial rye grass. According to the University of Minnesota Extension, Kentucky bluegrass is the most widely planted cool season grass in the northern United States. Disadvantages of Kentucky bluegrass are a shallow root system and its desire for lots of water. During dry periods it will go dormant and the leaf blades will turn brown. Once moisture returns it will regrow from its roots, providing the drought was not prolonged. During periods of prolonged or extreme drought, the roots of Kentucky bluegrass will die and it will not recover once rainfall resumes. With a fine leaf texture and a bunching habit, fine fescue (Festuca spp.) will blend well with other types of lawn grasses, especially bluegrass. It is well-adapted to shady sites. Fine fescue is tolerant of low moisture situations as well as drought, and may continue to perform when other grass types turn brown and go dormant. It is also tolerant of low fertility, which makes it an excellent low-maintenance choice. It does not withstand heavy traffic and should not be planted in these situations. A lawn grown of pure fine fescue will not mow well; plant it in a mixture with Kentucky bluegrass and perennial ryegrass. Slightly less hardy than fine fescue, tall fescue (Festuca spp.) is a rugged, clump-forming grass with coarse leaves. It is well-adapted for soils with poor drainage, shade, high salt content and areas receiving little or no irrigation in summer. Considered a low-maintenance type of grass, it is tolerant to insects, drought, and will remain green throughout the summer in most northern locations, due to its deep and extensive root system. Tall fescue is quick to germinate and become established, only slightly slower than perennial ryegrass. It is best seeded in spring to early summer as immature seedlings are not as cold hardy as established tall fescue grass plants. Although it is a cool season grass, perennial ryegrass (Lolium perrene) is intolerant of extreme cold and will often die out in extremely cold northern winters when snowfall is sparse or lacking. It has a bunch-type growth habit and requires considerable maintenance to keep it looking its best. Perennial ryegrass grows best in full sun, germinating and maturing rapidly. It is often included in grass mixtures along with Kentucky bluegrass and fescues to perform the role of “nurse crop.” However, perennial ryegrass can also out-perform and crowd out these slower-growing varieties if its seeds make up a large proportion of the seeding mixture. Because of its fast-growing quality, perennial ryegrass is often used to overseed and revamp existing lawns. It is an excellent choice for athletic fields and heavily-used yards of private homes.